Browser Health Info is the PUP that uses misleading techniques to prevent removal. Use Reimage to locate malicious components and get rid of them faster than with uninstall instructions. A full system scan blocks virus reappearance and prevents traffic to malicious domains. Browser Health Info is a suspicious browser extension for Google Chrome. This potentially unwanted application claims to be capable of checking computer’s system and protecting from cyber threats. However, it’s just a trick to convince users into installing it. It spreads via bogus websites that deliver a pop-up message stating that downloading this browser extension is necessary to leave the site. Besides, users can also find Browser Health Info promoted in software bundles. After the installation, it starts working as a browser hijacker. It might alter browser’s settings in order to control user’s behavior and display commercial content. The hijacker might replace current homepage and default search engine to search.yahoo.com. This potentially unwanted program (PUP) is also designed to prevent users from removing extension simply and quickly. It does not have a visible icon on the toolbar. What is more, if users try to open Chrome’s extension list, they are redirected to chrome://apps page. Undoubtedly, manual Browser Health Info removal might be challenging. Fortunately, users can employ a professional security program, for instance Reimage, and let it remove browser extension. 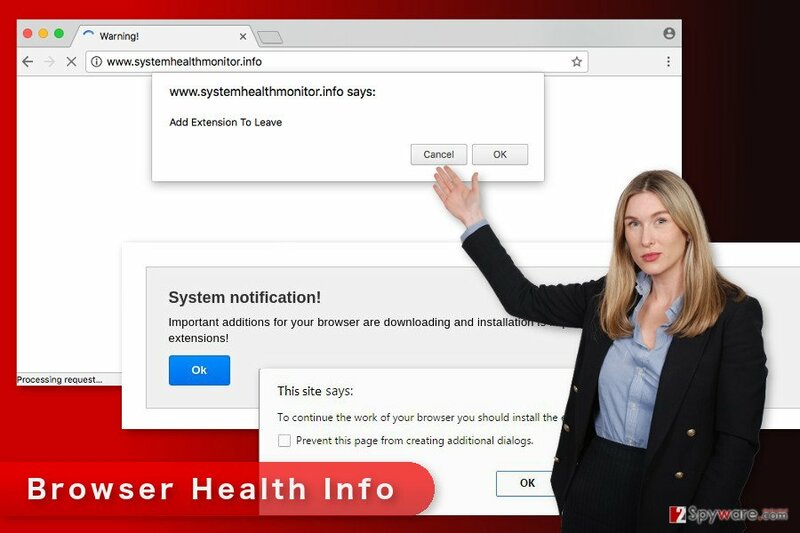 So-called Browser Health Info virus reminds us of System Health Checker. Both programs share similar features and behavior. After the hijack, this PUP modifies browser’s settings in order to provide third-party commercial content. When users click on sponsored links or ads, developers of this app generate revenue. However, users might be tricked into visiting a misleading or potentially dangerous website when they click on the search result. Undoubtedly, this feature is unfair because users always expect to find relevant and credible information on the first page of the search result. Sadly, System Health Info is interested in benefiting developers, but not users. Therefore, you can easily be redirected to a website that offers to install fake updates or programs that are presented as crucial to strengthening your computer’s security. In order to avoid other cyber infections, you should not only stay away from online ads but remove System Health Info too. Apart from taking control over the browser, it might also track information about users and share it with unknown third-parties. Thus, both you and the computer might be at risk. Browser Health Info is a suspicious browser extension that targets Google Chrome. The most common way to encounter an aggressive offer to install System Health Info is to end up on a misleading website that claims about the necessity to download it in order to leave the page. This site delivers a regular Chrome pop-up message. Thus, it might look legitimate. However, installing a suspicious PUP is unnecessary. Instead of clicking “Cancel” or “OK” buttons, users should simply close the browser or a tab. However, if close button is inactive, you should force-quit. “Cancel” button is also designed to install this PUP on the device. There are many ways how people can enter such misleading website. They might be redirected by an adware program that managed to sneak inside the system. The redirect might also occur when users browse through high-risk websites that are designed to trigger redirects to suspicious places on the web. What is more, System Health Info hijack might also occur during incorrect installation of freeware or shareware. The program might be included as an optional component in various software packages. Thus, if you rely on Basic/Recommended installation settings or rush through Advanced/Custom setup, you might accidentally install it. In order to avoid similar PUPs, you have to learn to install new programs carefully under Advanced/Custom settings and do not overlook the list of pre-selected entries. By unticking them, you stop PUPs from entering the system. As we mentioned at the beginning of the article, it might be complicated to remove System Health Info from the device manually. It alters Chrome’s settings, prevents from accessing the list of extensions and creates an invisible icon. Thus, if you cannot locate it on your own, you will need some help from reputable software. Instead of trying to terminate hijacker manually, we highly recommend opting for an automatic System Health Info removal option. 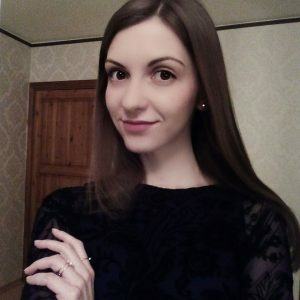 Install a reputable anti-malware program (or update your current one) and run a full system scan. Once the scan is over, this suspicious extension will be gone for good. Check the list of the installed programs. If you find some suspicious and unknown software, uninstall them immediately. They might be related to the Browser Health Info redirect virus. Here, look for Browser Health Info or any other recently installed suspicious programs. Make sure that any suspicious applications haven’t been installed on the device without your knowledge. Follow the steps below and get rid of unknown entries. Wait until you see Applications folder and look for Browser Health Info or any other suspicious programs on it. Now right click on every of such entries and select Move to Trash. When in the new window, check Delete personal settings and select Reset again to complete Browser Health Info removal. Once these steps are finished, Browser Health Info should be removed from your Microsoft Edge browser. Here, select Browser Health Info and other questionable plugins. Click Remove to delete these entries. Now you will see Reset Firefox to its default state message with Reset Firefox button. Click this button for several times and complete Browser Health Info removal. 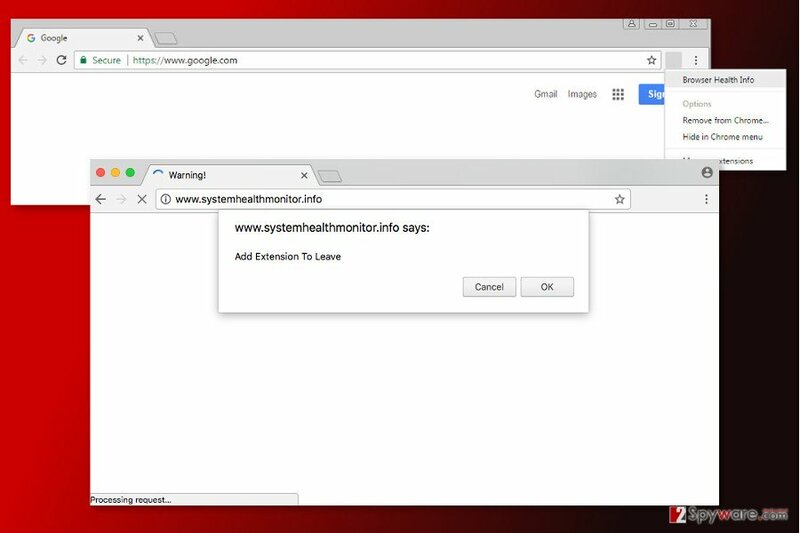 In order to remove Browser Health Info extension, you have to access the list of Chrome’s extensions. If you manage to do it, uninstall all suspicious add-ons, plugins, and other entries. Once it’s done, reset the browser. It helps to delete tracking cookies and other components. However, if you cannot delete this cyber parasite manually, please opt for the automatic removal option and run a full system scan with anti-malware program. Here, select Browser Health Info and other malicious plugins and select trash icon to delete these entries. Click Reset to confirm this action and complete Browser Health Info removal. Here, select Extensions and look for Browser Health Info or other suspicious entries. Click on the Uninstall button to get rid each of them. Here, look at the Homepage field. If it was altered by Browser Health Info, remove unwanted link and enter the one that you want to use for your searches. Remember to include the "http://" before typing in the address of the page. Now you will see a detailed dialog window filled with reset options. All of those options are usually checked, but you can specify which of them you want to reset. Click the Reset button to complete Browser Health Info removal process. ^ Rogue malware infections - what you need to know . BullGuard. The Official Website of Internet Security and Antivirus protection software developers. This entry was posted on 2017-05-29 at 03:28 and is filed under Stealing programs, Viruses. You can quickly scan the QR code with your mobile device and have Browser Health Info virus manual removal instructions right in your pocket. How did you remove Browser Health Info virus?